A new Zogby poll of senior executives, business owners, and members of union households finds that each of these groups thinks the best way to deal with illegal immigrants in the country is to enforce the law and cause them to return home. This is in stark contrast to lobbyists for large companies, such as the U.S. Chamber of Commerce, which argue for legalization. The findings of the survey are consistent with surveys done by the National Federation of Independent Business, which represents small enterprises, showing strong opposition to legalization. Among unions, the leadership strongly supports legalizing illegal immigrants, but the survey shows enforcement — not legalization — is by far the option favored by union members and their families. The survey uses neutral language and includes 7,046 members of union households, 2,490 executives (e.g., CEOs, CFOs, VPs or department heads), and 9,990 small business owners. When asked to choose between enforcement that would cause illegal immigrants in the country to go home or offering them a pathway to citizenship with conditions, most members of the business community and unions choose enforcement. Executives (e.g. CEOs, CFOs, VPs etc. ): 59 percent support enforcement to encourage illegals to go home; 30 percent support conditional legalization. Small Business Owners: 67 percent support enforcement; 22 percent support conditional legalization. Union Households: 58 percent support enforcement; 28 percent support conditional legalization. One of the most interesting findings of the survey is that members of the business community think there are plenty of Americans available to fill unskilled jobs. Union members feel the same way. Executives: 16 percent said legal immigration should be increased to fill unskilled jobs, 61 percent said there are plenty of Americans available to do unskilled jobs, employers just need to pay more. Union Households: 10 percent said increase immigration; 72 percent said plenty of Americans are available. Most members of the business community and union households do not feel that illegal immigration is caused by limits on legal immigration, as many of their lobbyists argue; instead, members feel it is due to a lack of enforcement. Executives: Just 13 percent said illegal immigration is caused by not letting in enough legal immigrants; 75 percent said inadequate enforcement. Union Households: 13 percent said not enough legal immigration; 74 percent said inadequate enforcement efforts. In contrast to many business groups and union leaders, most executives and union members think immigration is too high. Executives: 63 percent said it is too high; 5 percent said too low; 16 percent said just right. Small Business Owners: 70 percent said it is too high; 4 percent said too low; 13 percent said just right. Union Households: 63 percent said immigration is too high; 5 percent said too low; 14 percent said just right. While it is often assumed that the business community wants to legalize illegal immigrants and increase the level of legal immigration in the future, a new Zogby poll indicates that this is a minority position among top executives and small business owners. The reason for this mistaken impression is that a number of politically influential business lobbying organizations such as the U.S. Chamber of Commerce, the National Restaurant Association, and the National Association of Home Builders have all endorsed legalization and increased future immigration.1 It is important to note that the National Federation of Independent Business (NFIB), which is by far the largest organization representing small businesses, has not endorsed this position and, in fact, endorsed legislation that would have increased immigration enforcement efforts. Part of the reason for this is that NFIB, unlike other business associations, surveys its members and asks them what positions they should take on controversial subjects. NFIB’s surveys show strong support for immigration enforcement and strong opposition to legalization, which explains its position on immigration. The Zogby poll confirms this finding, with small business owners wanting enforcement, not legalization. The union movement has reversed its long-standing position that high levels of immigration are bad for labor, and in recent years has become an important part of the coalition critical of almost every enforcement effort and in favor of legalizing illegal immigrants. This is true both of the AFL-CIO and the Change to Win coalition. The Service Employees International Union (SEIU), part of the Change to Win coalition, has been at the forefront of this argument. The union movement generally has been critical of guestworker proposals, but supportive of efforts to increase permanent immigration. The business community in the United States is diverse and it is difficult to generalize about its position on any issue. But, with the notable exception of NFIB, the major business organizations discussed below do share several common beliefs. First, while they all briefly mention that immigration enforcement is necessary, they are critical of most enforcement efforts and argue that enforcement in general has failed. Second, all endorse legalizing illegal immigrants with conditions. Third, they all share a belief that illegal immigration is caused at least in part by not letting in enough immigrant workers legally. As a result, they all call for changes in policy that would increase the number of legal immigrants allowed into the country to work. In particular they often mention unskilled workers who do jobs that require relatively little education, often on a seasonal basis, as being especially needed. Repeating a common theme, Chamber President and CEO Thomas J. Donohue wrote in 2007 that we need a guestworker program “to fill jobs Americans don’t want.”3 The idea that increasing wages, benefits, and working conditions might attract more Americans to such jobs does not seem to have been considered by the Chamber’s leadership. In terms of their policy recommendations, the Chamber’s 2008 report on its positions and activities makes it clear that the Chamber supports “earned legal status leading to legal permanent residency for qualified” illegal immigrants. The report is also clear that the Chamber will fight any legislation or effort to enforce immigration laws if it also does not legalize illegal immigrants and increase future legal immigration. They oppose mandatory employment verification without more testing of the system. And they make it clear that the Chamber has “led the legal fight against DHS’s No Match Regulation.” This regulation would have informed employers when the Social Security numbers of their workers did not match the Social Security Administration’s records. The Chamber’s report from 2008 also states that the “Chamber will monitor and continue to oppose the efforts … to mandate that federal contractors use the E-Verify program.”4 This regulation was eventually implemented. The Chamber has repeatedly made clear that it opposes enforcement if it is not coupled with both a legalization of illegal immigrants and an increase in legal immigration. Specifically, they have repeatedly called for new “guest” worker programs, also referred to as “temporary” worker programs. These programs may or may not allow participants to stay permanently. Essential Worker Immigration Coalition. The Essential Worker Immigration Coalition (EWIC) was created in 1999. It is a group of business organizations pushing for legalization of illegal immigrants and an increase in legal immigrant workers allowed into the country. Among its members are the U.S. Chamber of Commerce, the National Association of Home Builders, the American Hotel & Lodging Association, and the National Restaurant Association. Other industry associations represented on the current membership list include meat and poultry processing, landscaping, home health care, agriculture, florists, and transportation.5 In earlier years it also included specific companies like Marriott International, Tyson Foods, Pilgrim’s Pride Corporation, Walt Disney World Co., Cracker Barrel Old Country Store, TGI Fridays, and Radisson. In addition to advocating for a legalization program and increased legal immigration, EWIC also lobbied against the 2008 Secure America through Verification and Enforcement (SAVE) Act, which would have increased immigration enforcement. They not only objected to specific enforcement provisions in the bill, but also to the fact that it did not allow in more legal immigrant workers, which they feel is the only way to reduce future illegal immigration.9 In addition, in 2009 they also lobbied against requiring the use of E-Verify for federal contractors getting stimulus money and other efforts to enforce immigration laws.10 Like the Chamber of Commerce, EWIC and its member organizations consistently argue for the legalization of illegal immigrants, an increases in future immigration, and have been critical of most immigration enforcement efforts or legislation. The restaurant association has long argued for an “earned path to permanent residence for certain undocumented immigrants.”12 The association’s chairman, Craig Miller, wrote in 2006 that “our immigration system does not reflect America’s need for workers.” And after discussing the limited number of green cards (permanent immigration slots) available for service workers, Mr. Miller said, “No wonder there are almost 12 million undocumented individuals in America today.”13 The National Restaurant Association reflects the views of many business associations that illegal immigrants need to be legalized and legal immigration needs to be increased because limits on legal immigration cause illegal immigration. National Federation of Independent Business. NFIB is one of the largest and most politically influential business organizations in the country. In 2006 and 2007 it specifically did not endorse the bills being considered by the U.S. Senate that would have legalized illegal immigrants, increased future levels of legal immigration, and improved immigration enforcement. While they had complaints with specific provisions, the Chamber of Commerce, EWIC, and other business groups did endorse either of these bills. Moreover, the Chamber, EWIC, and their allies strongly opposed the 2008 SAVE Act, but NFIB endorsed the legislation. The SAVE act did not increase legal immigration or legalize any illegal immigrants. Instead, it would have increased immigration enforcement, in particular requiring employers to verify the legal status of new workers.14 The NFIB policy position differs significantly from other business groups because, unlike other organizations, the Federation surveys its members and then lobbies based on the results of the survey. The one area where NFIB does agree with other business groups is on the H-2B program for seasonal workers. The organization and its members also support guestworker programs for agriculture.16 But other than seasonal agriculture and seasonal non-agriculture work, NFIB does not endorse increasing immigration, which makes them very different from the other business organizations discussed above. Historically the labor movement has felt that increases in the supply of labor from immigration would lower wages and decrease employment opportunities for their members.17 In the past, labor also was concerned that immigration would make it more difficult to organize workers. In recent years, however, almost every major union has endorsed legalizing illegal immigrants. They also have been critical of many, if not most, enforcement efforts. There have been indications that some in the union movement feel that more green cards (permanent immigration) for the families of immigrants already here are also needed, but in general this has not been the high priority that legalization has become. Most unions have been critical of guest/temporary worker programs, arguing that if there are such programs they should allow workers to stay permanently. They have generally been opposed to expansion of these temporary worker programs and instead push for changes in them that would reduce the potential for exploitation. It is worth noting that even a cursory read of the blog entries by union members on union websites reveals a significant diversity of opinion on immigration, with a large share of members strongly opposed to legalization and other union positions on the issue. AFL-CIO and Change to Win. The largest federation of unions in the country is the AFL-CIO. The second largest is the Change to Win coalition. The current positions of both groups on immigration can be found in a jointly published document called The Labor Movement’s Framework for Comprehensive Immigration Reform. It calls for an “inclusive, practical, and swift adjustment-of-status” for illegal immigrants to legal status.18 On its website, the AFL-CIO makes clear that legalizing illegal immigrants would “boost” the economy and protect workers.19 The joint document with the Change to Win coalition calls for increased immigration enforcement, particularly a program that allows employers to verify that their workers are authorized to work in the United States, but also ensures workers are protected. At one point in the document, it seems to indicate that limits on immigration cause illegal immigration. They call for the “improvement” of temporary worker programs, but explicitly state that they oppose their “expansion.” Elsewhere in the document the unions state clearly that “The long-term solution to uncontrolled immigration is to stop promoting failed globalization policies.” So the union movement does seem to differ with businesses on whether limits on immigration cause illegal immigration. In the past, two unions in the Change to Win coalition (SEIU and UNITE HERE) supported the expansion of guestworker programs, but they now have agreed with the AFL-CIO that any increase in temporary immigration should be handled by a commission that bases its decisions on labor market needs. The joint statement discusses at length the importance of family-based immigration and the reasons to preserve it, but stops short of explicitly calling for an increase in green cards for the family members of immigrants. With the notable exception of NFIB, the leaders of the business groups and unions discussed above all have made clear that they believe legalizing illegal immigrants is central to immigration reform. The business groups all favor significant increases in legal immigration, though NFIB only wants increases in the seasonal agricultural and non-agricultural temporary worker programs. Business groups, again with the exception of NFIB, further argue that, because of limits on legal immigration, people come to America illegally “to fill jobs Americans don’t want.” However, the Zogby poll reported here indicates that most members of the business community and those who live in union households have a very different point of view. Overall Immigration Numbers. 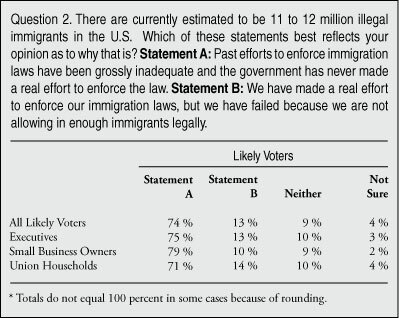 Question 1 asked voters if they think the overall level of immigration is too high. (Figures for Question 1 come directly from Census Bureau data.). In all three groups, the results show that union members and business people overwhelmingly think that immigration is too high. Some advocates for legalization have argued that increasing legal immigration would simply involve legalizing an illegal flow that is already taking place. Tamar Jacoby of Immigration Works, a business lobbying organization, is one of many who argue that “U.S. economic needs have drawn roughly 1.5 million foreigners — workers and their families — into the country. But we issue only about one million visas.”22 She also argues that “the only way to stop illegal outflows from Mexico is to legalize them.”23 Yet roughly two-thirds of members of the business community and union households think immigration is too high. 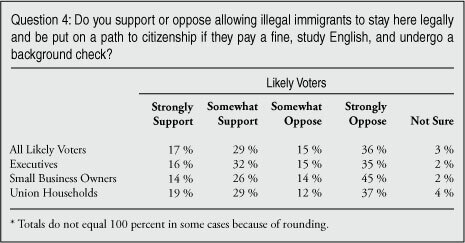 Thus it seems there is very little support among these groups for a proposal to keep immigration at the current level, but make it all legal. Of course there is the question of whether an increase in legal immigration would create more social networks and thus increase illegal immigration.24 In the mid-1980s Congress legalized nearly three million illegals and legal permanent immigration is about double what it was then, yet illegal immigration has not slowed. But putting aside the policy questions surrounding such a proposal, this poll shows that executives, small business owners and unions members strongly oppose this point of view. Causes of Illegal Immigration. Question 2 addresses one of the central questions in the current debate: Is illegal immigration caused by having limits on legal immigration that are too strict or is it caused by a lack of enforcement? The responses to Question 2 from members of all three economic groups show that they think lack of enforcement is the cause. As made clear above, the leaders of some business groups and even some parts of the union movement believe that enforcement efforts have failed and are immoral. They also feel the reason so many people come into the country illegally is that not enough people are allowed in legally. But both union members and members of the business community strongly disagree. Of senior executives, 75 percent said illegal immigration was due to lack of enforcement, as did 79 percent of small business owners, and 71 percent of those in union households. 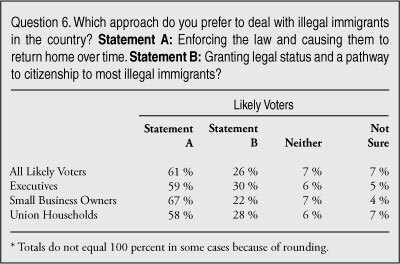 A modest share of voters did not agree with either statement or were unsure of an answer, but few agreed with leaders in the business community that illegal immigration is caused by limits on legal immigration. Executives, business owners, and union members simply do not accept the idea that illegal immigration is caused by the current limits on legal immigration. Need for Immigrant Workers. Question 3 explores one of business organization leaders’ most important arguments: that more workers are needed, particularly for jobs that require relatively little education. As EWIC states, “Our immigration laws provide few ways for American businesses that cannot find U.S. workers to hire from abroad. Therefore, each year hundreds of thousands of additional undocumented workers enter the country.” But the Zogby poll finds that actual business people and members of union households disagree; with 61 percent of senior executives, 65 percent of small business owners, and 72 percent of members of union households responding there are plenty of workers available. It must be remembered that Statement B in Question 3, chosen by most members of the business community, states that employers “should pay more and treat workers better” if they can’t find workers. While it is not so surprising that those associated with unions would feel that higher pay and better working conditions are the best way to meet labor demand, even a majority of executives and small business owners felt this way. Legalizing Illegal Immigrants. Questions 4 through 6 examine the issue of legalizing illegal immigrants. Question 4 used neutral language and found some support for a conditional legalization, with 48 percent of executives, 40 percent of small business owners, and 47 percent of members of union households saying that they would “strongly” or “somewhat” support a legalization program with conditions. But for each group, slightly more voters said they are against legalization than said they are for it. In fact, a majority of small business people said they are against a conditional legalization by statistically significant margins. What is so striking about this finding is that business owners who support legalization often receive a good deal of publicity, but in fact legalization is a minority point of view among small business owners. As already discussed, this finding is entirely consistent with statements on the NFIB website showing that their surveys come to the same conclusion. But this fact is not well covered by the media. Question 5 asked if voters would support enforcing the law and causing illegal immigrants to go home. The responses show overwhelming support for an enforcement approach, with 87 percent of senior executives, 89 percent of small business owners, and 85 percent of those in union households saying they “strongly” or “somewhat” support enforcement to deal with illegal immigrants in the country. 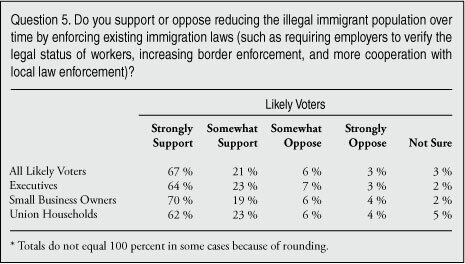 A large share of all three groups is enthusiastic about enforcement, with majorities of executives, small business owners, and union voters saying they “strongly” support enforcement that would cause illegal immigrants to go home. The share saying they strongly oppose enforcement is in the low single digits for all three groups. Question 6 asked voters which approach they prefer, enforcement or conditional legalization, and here we see some division among voters. Among executives, 59 percent to 30 percent prefer enforcement over legalization; for small business owners it is 67 percent to 22 percent for enforcement over legalization; among union voters it is 58 percent to 28 percent. What is so striking about all these numbers is that the views of union voters are in no way reflected among union leaders, all of whom support legalization. The same is true for business groups that represent large corporations, such as the Chamber of Commerce. Again, the one exception is NFIB, which states clearly on its website that it members strongly oppose legalization. The Zogby poll’s results closely match those of the NFIB. Zogby International was commissioned by the Center for Immigration Studies to conduct an online survey of 42,026 adults. A sampling of Zogby International’s online panel, which is representative of the adult population of the United States, was invited to participate. For small business owners, Zogby asked respondents if they owned a small business and the number of workers they employ. Of those who indicated that they owned a small business, 86 percent said they employed fewer than 10 workers. A total of 9,990 self-indentified small business owners who are likely voters participated in the survey. Executives are those who indicated they were either a C-level executive, managing partner, managing director, or served on the board of directors.25 A total of 2,490 senior executives who are likely voters participated in the survey. Persons in union households are either a member of a union themselves or live with someone is a union member. A total of 7,046 people in union households who are likely voters participated in the survey. Slight weights were added based on region, party, age, race, religion, gender, and education to more accurately reflect the U.S. population. The survey was conducted by Zogby from November 13 to 30,, 2009. The margin of error for all likely voters is +/- 0.5 percent. 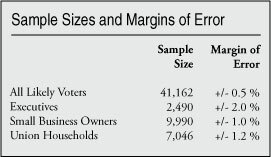 The margins of error for executives, business owners, and those in union households are shown in the table below. This survey of business people and members of union households is one of the largest of its kind on immigration. The findings are not surprising. Voters have always been skeptical of immigration and opposition to legalization is long-standing, as the 2006 and 2007 debates over comprehensive immigration reform made clear. But this survey is unique because it allows us to compare the views of senior executives, small business owners, and voters in union households to those of business organizations and union leaders. The findings are stark; the leaders of most, though not all, business groups think that limits on legal immigration are the cause of illegal immigration and that more unskilled immigrant workers need to be allowed into the country. In contrast, most executives and business owners think that lack of enforcement is the cause of illegal immigration. Most interesting is that small business owners and executives state that there are plenty of Americans available to fill jobs that require relative little education and if employers cannot find workers, they need to pay more and treat American workers better. Not surprisingly, members of union households feel the same way. When it comes to the issue of legalizing illegal immigrants, members of the business community and unions strongly disagree with much of their leadership. With the exception of the nation’s largest small business association, NFIB, most business groups have strongly supported efforts to legalize illegal immigrants. NFIB states on its website that its survey of members shows that “79 percent believe undocumented workers should return to their country and seek admission legally.” It also states that “NFIB will not support legislation that contains an amnesty for undocumented workers.” In sharp contrast, the U.S. Chamber of Commerce, the National Association of Home Builders, the American Hotel & Lodging Association, the National Restaurant Association, and dozens of other business groups have lobbied hard for legalization and an increase in legal immigrants, particularly more guestworkers. This Zogby poll finds that about two-thirds of executives and small business owners favor enforcement over legalization as the best way to deal with illegal immigrants in the country. The results are very much in line with NFIB’s survey findings. Among members of union households, there is also strong support for enforcement and strong opposition to legalization. Using neutral language, the poll finds that twice as many voters associated with unions prefer enforcement over a conditional legalization as the best way to deal with illegal immigrants in the country. What is so striking is that most union leaders, including those at the AFL-CIO and the Change to Win coalition, strongly back legalization for illegal immigrants. In contrast, their members seem to feel that enforcing the law and causing illegal immigrants to return home is the best option. Perhaps this is because union members and their families want higher wages and better working conditions for less-educated native-born workers. While union leaders may also want this, they may also see legalized immigrants as potential new members, giving the union leadership a somewhat different point of view than their members. The overall findings of this poll show a significant divide between the leadership of most business organizations on the one hand and senior executives and small business owners on the other. This same divide can also be found between the leadership of most unions and union members. This profound disagreement on immigration means that it would be mistake to think of the business community or the union movements as speaking with one voice on this issue. When business groups and unions leaders speak on immigration they may reflect their own views, but not necessarily those of their members. 1 All of these organizations are members of the Essential Workers Immigration Coalition (EWIC), which lobbies to legalize illegal immigrants and increase legal immigration. It is also critical of most enforcement efforts. The policy positions of EWIC will be discussed later in this report. EWIC’s current member list can be found at http://www.ewic.org//index.php?option=com_content&task=view&id=48. 5 See the 2010 membership list, at http://www.ewic.org//index.php?option=com_content&task=view&id=48. 6 This statement is listed as one of the organization’s principles on its website, at http://www.ewic.org/index.php?option=com_content&task=view&id=15&Itemid=52. 7 The letter, dated June 11, 2007, and addressed to Sens. Harry Reid and Mitch McConnell can be found at http://www.ewic.org/includes/pdf/Letters%206.11.07%20Reid.pdf. 8 See, for example, the letter to Congress dated May 23, 2007, at http://www.ewic.org/includes/pdf/Letters%205.23.07%20Oppose.pdf ; and also a letter dated June 27, 2007, at http://www.ewic.org/includes/pdf/Letters%206.29.07%20Boxer%20Amendment.pdf. 9 The letter, dated February 12, 2008, can be found at: http://www.ewic.org/images/357261813_1.pdf. 10 See letters dated February 4, 2009, and March 26, 2009, at http://www.ewic.org/images/essential_worker_imm_coalition.pdf and http://www.ewic.org/images/napolitano_biz_lltr3_26_09.pdf. 11 See NIF Backgrounder from September 2008, at http://www.immigrationforum.org/images/uploads/CIRBackgrounder.pdf. 12 See the association’s web site public policy issue brief: http://www.restaurant.org/government/issues/issue.cfm?Issue=immigration. 13 See opinion piece in the Miami Herald, April 16, 2006, at http://www.restaurant.org/pressroom/rapid_response.cfm?ID=1254. 14 The NFIB letter of support for the SAVE Act can be found at http://www.nfib.com/issues-elections/issues-elections-item/cmsid/35426/. 15 See the NFIB immigration and summarized polling results, at http://www.nfib.com/research-foundation/issues/immigration/. 16 Their support for seasonal guestworker programs can be found as part of their overall position on immigration:, at http://www.nfib.com/research-foundation/issues/immigration/. 17 See “American Unionism and U.S. Immigration Policy” by Vernon M. Briggs Jr., Center for Immigration Studies Backgrounder, August 2001, http://cis.org/Unionism%2526ImmigrationPolicy. 21 To see all of the areas for which the union has issued statements, see their immigration web page at http://www.seiu.org/political/issues/immigration/. 24 For a discussion of the link between legal and illegal immigration see, “Two Sides of the Same Coin: The Connection Between Legal and Illegal Immigration,” at http://www.cis.org/node/263. 25 Respondents were asked, “Which of the following best explains your current job responsibilities: 1. Chief Executive Officer, Chief Financial Officer, Chief Information Officer, Managing Partner, Managing Director, President, Owner, etc; 2. Department Head/Vice President/Director/Administration; 3. Board of Directors/Consultant. All responses other than these three were not considered senior executives and are not included in the results for executives. Only 0.9 percent of executives self-identified as small business owners, so the survey is basically measuring the views of professional managers.